Traffic crawls on the northbound lanes of the Henry Hudson Parkway leading out of Manhattan on Friday. An Amtrak police officer with a bomb sniffing dog watches as people board a train en route to Boston at New York's Penn Station, as travelers set out for the long Memorial Day weekend on Friday. 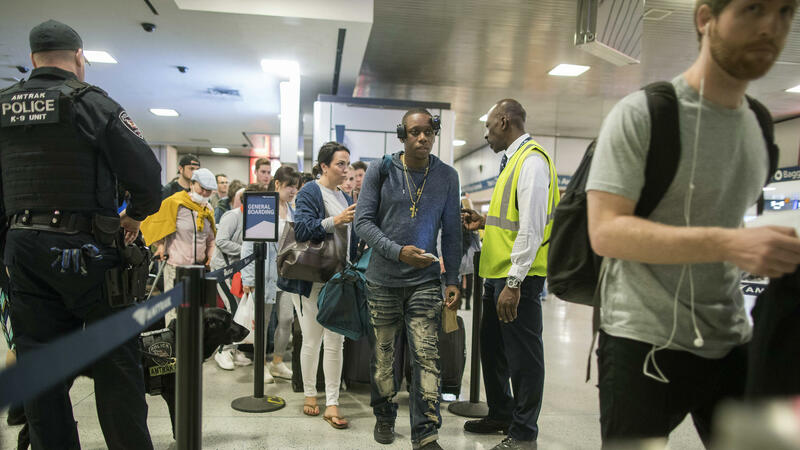 If you've already tried to get away for the long holiday weekend or are planning on leaving soon, you probably know this: the highways, airports and train stations are packed with like-minded folks trying to get out of town for the unofficial start of the summer vacation season. 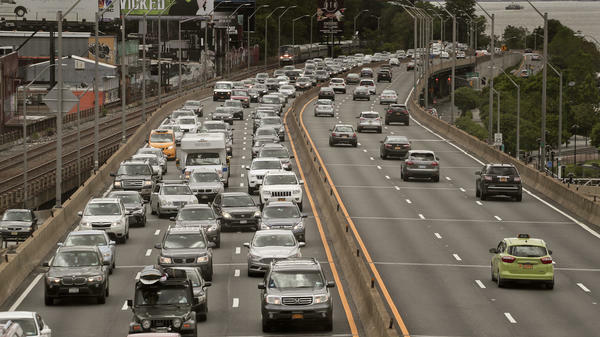 Planes, trains and automobiles are overrun with Memorial Day weekend travelers and those who study traffic analytics say even people who slipped out on Thursday to beat the traffic were greeted by gridlock in many cities. 1. It's going to cost more. Especially if you're driving. The price of regular unleaded gasoline was averaging about $2.97 a gallon nationally going into the Memorial Day weekend, according to Gasbuddy.com, AAA and other sources. "The last time we were at $3 [a gallon] was back in October of 2014," says Patrick Dehaan, senior petroleum analyst at Gasbuddy.com. That's about 60-cents a gallon higher than at this time last year, and "it's going to cost motorists a billion dollars more at the pump, just from Thursday to Monday alone." The reason for the increase is higher crude oil prices, which are also near their highest levels in three and a half years. "We can point the finger at OPEC, which for the last 17 months has been producing less oil to push the price of oil up," Dehaan says. If prices stay up, it could be the most expensive summer for long road trips in four years, but there are some indications gas prices could level off or even drop a bit in coming weeks and months. Reports Friday suggest that OPEC countries and Russia may start producing more oil soon and that led to big drops in the price of oil, with U.S. crude falling four percent on Friday and Brent crude dropping three percent. 2. But high gas prices aren't deterring many people from driving. AAA projected 36.6 million cars full of people hitting the road this holiday weekend, a nearly five percent over last year and the highest number of Memorial Day weekend drivers in 10 years, even though higher gas prices are taking more cash out of travelers' wallets. "That's not deterring anybody from hitting the road for the holiday," says Mark Burfeind of the Seattle-based transportation analytics company INRIX, which uses data to analze traffic patterns to help drivers plan the best times and routes to take. "I think the strong economy is really giving people the extra motivation to hit the road and get out even though gas prices are up," he says. Many drivers aren't happy about the higher prices, but say they won't change their planes because of it. While pumping gas at a service station on Chicago's north side that was charging nearly $3.50 a gallon on Thursday, 38-year-old nurse Denice Williams called the price "stupid high and ridiculous," but says the extra cost won't make her change summer vacation plans. "I'm taking my kids to the Wisconsin Dells. We're going to drive all the way," she says of the popular water park mecca nearly four hours northwest of Chicago. "I don't set no price on their fun," Williams adds. 3. Getting on a plane this summer? You'll have lots of company. Airlines are expecting more Americans to fly this summer than ever before. "We are projecting that 246 million people will fly between June 1 and Aug. 31," says Vaughn Jennings, spokesman for the industry group Airlines for America. That's a nearly four percent jump in the number of air travelers over last summer and an all-time high. "We attribute this growth to the accessibility and affordability of air travel today, as air fares continue to decline for the third consecutive year." Airlines are adding capacity to meet this demand, with more flights to more destinations, and they will be using bigger planes to accommodate more passengers on some routes. But that doesn't mean you can expect to be spared the dreaded middle seat or get more leg room for free. Those are perks most airlines will make you to pay for these days, along with checked bag fees and in some cases, extra fees to put luggage in the overhead bin, especially if you book "basic economy fares." Nonetheless, AAA's Memorial Day weekend travel report indicates that airfares are seven percent cheaper than last year at this time. But those air fares may not stay low for long. Rising jet fuel prices are eating into what had been record airline profits in recent years. John Heimlich, Chief Economist for Airlines for America, says jet fuel prices averaged $2.03 a gallon in the first quarter of the year, "and that's pressuring airline profitability." And he says if oil prices continue to go up, higher fares could follow, because "every penny per gallon per year means $200 million for this industry." The only thing keeping fares down for now, Heimlich says, is stiff competition. "We're in a marketplace where low-cost and ultra-low-cost carriers are growing the fastest, responding to an American public in particular that is extremely price sensitive," he says. Survey after survey shows that the number one criteria for buying a plane ticket, particilarly for leisure travelers, Heimlich says, "is price — affordability, affordability, affordability." "That's an environment where it's challenging to" raise fares, he adds. 4. Only half of Americans will take a summer vacation. Many families simply cannot afford it. According to a new survey from the personal finance site, Bankrate.com, 49 percent of Americans aren't going on vacation this summer. Some say they can't get away because of family obligations or work commitments, but the biggest reason people don't take a vacation is because it would cost too much and they have other, more pressing family needs and expenses. "I cannot plan a vacation," says 35-year-old Mohammad Akbar of Chicago, as he pumps gas on the city's north side. "I cannot afford it." Akbar is a student, who works a part-time, low-wage job to help make ends meet. "I don't have a lot of savings," he says. And he's not alone. According to the Bankrate.com survey of 1,000 people, nearly one in four respondents (24 percent) say they won't take a summer vacation this year because they cannot afford it. Bankrate analyst Amanda Dixon says even though the economy is growing, not all Americans are cashing in. "Wages have been stagnant for a while so for many Americans, they haven't gotten a raise in a long time, or they haven't been able to move over to a new job that pays them more money," she says. "And so a lot of people are still living paycheck to paycheck and really may not be able to go on vacation this summer." Dixon says the survey found that millennials, ages 18-37, "are more likely to say they're not going on vacation this summer because they can't afford it or because they have too much going on at work," than people in older age groups. The median amount of money those who can get away for a vacation is summer will spend will be 1,000, says Dixon. Twenty-four percent of respondents say they will spend $2,000 or more on their vacation. The Bankrate.com survey also finds that just 36 percent of those who get paid vacation days plan to use all of that time this year. About 1 in 4 (26 percent) say they'll only use a quarter of their paid vacation time, and 13 percent don't think they'll use any of it. Dixon suggests that may not be wise. "Generally, people tend to be more productive when they do take breaks," she says. "So if you're in a position where you're constantly working all the time and you're not taking any of you vacation days, you're really putting yourself into a position to eventually burn out, and that's not good for you, and not good for your company." 5. Tired of toll booths, traffic jams and cramped airplane seats? Take the train. If you don't want to rush through crowded airports, cram your bag into an overstuffed overhead bin, and uncomfortably squeeze into the middle seat, Amtrak wants you to consider the train. If you'd rather be turning the pages of a good book or surfing the Web than gripping your steering wheel while your blood pressure rises, consider a trip down the tracks instead. Amtrak is expecting heavy ridership this summer, including more than 320,000 customers over the Memorial Day week, as the passenger rail service's "refreshed" coaches offer "large, spacious seats with ample leg room," according to an Amtrak news release, even for the lankiest of travelers. And get this: there's no middle seat on the train. Many Amtrak trains allow you to travel with small pets and bikes, and you're free to use your phone, laptop or tablet all the time, as there's no "airplane mode." Many routes offer incredible scenic views, especially on longer routes. The rail service is making travel more comfortable and convenient for nursing mothers, by installing lactation suites this summer in four stations — Washington, D.C.'s Union Station, Baltimore's Penn Station, Philadelphia's 30th Street Station and Chicago's Union Station. A fifth "Mamava" lactation suite will be coming to New York's Penn Station in the fall. The cost of an Amtrak ticket can be comparable to driving, especially as gas prices in some parts of the country soar above $3 a gallon. And in some cases you can save time over driving or flying, especially along the congested Northeast corridor, and even on some Midwest routes, like Chicago to Milwaukee and Chicago to Michigan. "Customers can visit the most popular cities in the country for their summer travel, whether it's to catch a baseball game, explore a new city, experience a summer musical festival, have an outdoor biking or hiking adventure or take it easy and relax at a beach," says Tim Griffin, Amtrak's chief marketing officer.